Usually I think these sort of debates are a waste of time but am keen to see the video of this one – it will be on Youtube eventually. In previous debates Craig attempts to use cosmology to “prove” the existence of his god (I use the word “use” as meaning very opportunist use of motivated reasoning). In most debates his opponents are usually not completely familiar with modern cosmology and he gets away with murder in his misrepresentation of the science. But Sean Carroll is a different proposition. Not only is Sean a researcher and teacher in cosmology he is also an excellent communicator of science. His recent book, The Particle at the End of the Universe, won last year’s Royal Society Winton Prize for best science book (see The particle at the end of the universe’ wins Winton Prize). I think his tongue was in his cheek with the last sentence. It is a full lecture but well worth watching – especially if you are interested in the science-religion debates. Sean Carroll presents these cosmological arguments well – and his analysis is far more up to date – and “with it” than those theologians who venture into the area. Just compare this with the rubbish W. L. Craig comes out with. This lecture really puts the theological argument that God is a “better explanation” of life than the multiverse into perspective. Thanks to Your Thanksgiving viewing « Why Evolution Is True. Congratulations to Sean Carroll – the winner of the 2013 Royal Society Winton Prize for science books. (see Higgs boson book scoops Royal Society Winton Prize). His book, The Particle at the End of the Universe, beat 5 other excellent titles. and the Judges were unanimous in their decision. The book was also recently reviewed by Richard Easther on SciBlogs (see The Higgs, the Universe and Everything). I was very impressed with his last book, From Eternity to Here , so I am very much looking forward to reading this one. Here is a short video of Sean reading from his book before the announcement. ‘The particle at the end of the universe’ by Sean Carroll. These books are also being reviewed on SciBooks. See Birds’ Own Stories Captivate for a review of Tim Birkhead’s book. The recent Science Weekly podcast has a great discussion of all the books shortlisted for the Winton prize. In it two of the judges speak really enthusiasticly about all these books – and some that didn’t make the shortlist. Really makes we want to get all the books on the list and get stuck into reading them straight away. Whatever. The title certainly makes a change from those like “The Limits of science.” How many times have I seen such titles on articles written by religious apologists, philosophers of religion, or even straight non-religious philosophers. These articles usually annoy me because they often set up a straw man – a claim that science has no limits – which no scientists is making. So it’s nice to turn the tables for a change. I often get criticised by philosophers, theologians, philosophers of religion and students of philosophy for making philosophical mistakes – or so they claim. I’ve been told that I should not write about the science of morality if I haven’t read and studied a long list of ancient, and not so ancient, philosophers. Commonly I am admonished for trying to determine an “ought from an is” – a violation of “Humes Law.” And I have been told that scientists should leave questions like origins of life and the universe, or the question of existence of supernatural beings, to philosophers. Such questions, they tell me, are outside the limits of science. Very often my reply to such criticisms is that there is no such thing as an accepted unified philosophical dogma. That the claims thrown at me come not from philosophy in general, but from a particular school of philosophy. There is “philosophy” and then there is “philosophy.” My critics should be up front and advance their claims as representative of their own philosophy, or the particular school of philosophy they adhere to, not as representative of philosophy in general. So I am pleased to see the on-line publication of the paper “What Do Philosophers Believe?“ by David Bourget and David J. Chalmers. This study confirms that philosophers are indeed divided on a number of issues – they hold a range of beliefs which can influence their philosophical thoughts and positions. These beliefs are influenced by a range of demographic and social factors. And philosophers themselves often have a false opinion of the degree to which different beliefs are common in their professional community. 1. A priori knowledge: yes 71.1%; no 18.4%; other 10.5%. 5. Epistemic justiﬁcation: externalism 42.7%; internalism 26.4%; other 30.8%. 6. External world: non-skeptical realism 81.6%; skepticism 4.8%; idealism 4.3%; other 9.2%. 8. God: atheism 72.8%; theism 14.6%; other 12.6%. 10. Knowledge: empiricism 35.0%; rationalism 27.8%; other 37.2%. 15. Metaphilosophy: naturalism 49.8%; non-naturalism 25.9%; other 24.3%. 16. Mind: physicalism 56.5%; non-physicalism 27.1%; other 16.4%. 18. Moral motivation: internalism 34.9%; externalism 29.8%; other 35.3%. 20. Normative ethics: deontology 25.9%; consequentialism 23.6%; virtue ethics 18.2%; other 32.3%. 25. Science: scientiﬁc realism 75.1%; scientiﬁc anti-realism 11.6%; other 13.3%. So I feel vindicated in answering my critics by pointing out the lack of consensus among philosophers on many issues. What right has a philosopher of religion to assure me their arguments against my statements are “philosophical” (and not just representative of a school of religious philosophy)? Similarly, why should I simply take on trust assurances that “philosophy” has a particular position on scientific realism, moral motivations or the nature of ethical norms? There is “philosophy” and there is “philosophy.” If you wish to lecture me about philosophical positions at least be open about the philosophical school you are representing or adhere to. Frankly, I am unsurprised at the lack of consensus among philosophers. It contrasts sharply with the situation in science – which on most matters has a high degree of consensus. OK, there are debates at the edges – and these can be intense. Remember the scene in “The Big Bang Theory” where a romantic alliance between two physicists broke up because one was a “String Theorist‘ while the other adhered to “Loop Gravity“. Just imagine the problems they would have raising their children! “Survey a bunch of scientists on comparable topics, and you’ll find overwhelming consensus that, for example: Evolution is true; Relativity and Quantum Mechanics are basically right on (and anything that replaces either is going to have to reduce to both at suitable scales); that the Earth’s surface moves in manners described by Plate Tectonics; and so on. But while we should be aware of the different levels of confidence in philosophical and scientific knowledge this does not show differences in personal capabilities between the two professions. The difference is exactly what we should expect from the different nature of the two subjects. Philosophy could be said to be an “armchair” subject. Philosophers reason and think. They apply logic to hypothetical situations. Often scenarios which have no possible reality but are at least “logical possibilities” will get a lot of attention. It’s also not surprising that demographic and social factors can influence philosophical reasoning. Humans are just not very rational and their reasoning often suffers from ideolgical and social motivations. Science is usually a very much “hands on” subject. Ideas are tested against reality. Scientists are just as irrational (or human) as anyone else – they also easily fall into the trap of motivated reasoning. But the final arbiter of ideas for science is reality itself. Experiments can be performed or observations made to check predictions of hypotheses. Of course philosophy and science does merge at the edges. There is actually a field of experimental philosophy and good philosophers do pay attention to scientific knowledge. On the other hand some science cannot always be tested in practice – at least with the current technological limits. Some scientists seem to work more like philosophers – and some philosophers work more like scientists. But let’s get away from the idea that logic or philosophy is the final arbiter of knowledge. That is taking philosophy beyond its limits. This week sees the launch of another book on the Higgs Boson. This one is by the cosmologist Sean Carroll – The Particle at the End of the Universe: How the Hunt for the Higgs Boson Leads Us to the Edge of a New World . I found Carroll’s last book From Eternity to Here: The Quest for the Ultimate Theory of Time excellent so am looking forward to this one. he has a real gift for explaining the complex science of cosmology and particle physics clearly for the lay person. See also: The Excitement Grows! The workshop I described in Moving Naturalism Forward took place – with a few amendments. A half day was lost because of the super storm Sandy. And medical issues led to Patricia Churchland, Lisa Randall, and Hilary Bok cancelling at the last minute. Pity – I was looking forward to all those contributions. Turns out that the workshop basically centred on discussions and not presentations. I think these will be fascinating, considering the calibre of the scientists and philosophers present. And the fact that there are clear issues of difference between many of them. Videos of the discussions should be up in the near future at the Moving Naturalism Forward website. He intends to post more in the coming days – probably about three. 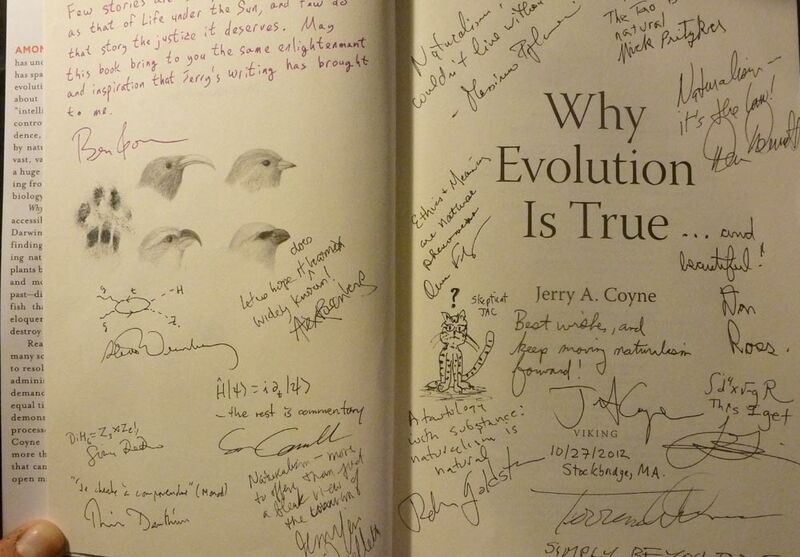 In a nice little twist Jerry collected signatures from the workshop participants on the title page of a copy of his book Why Evolution Is True . In his post Loosen those wallets he undertakes to sell this with “every penny” going Doctors Without Borders? Cosmologist Sean Carroll has announced a break from blogging on Cosmic Variance. I picked up this news from Jerry Coyne‘s blog Why Evolution is True! (also the title of his book) (see Sean Carroll says goodbye). Like Jerry, I think that is a great pity. I find Sean Carroll’s blog posts interesting. I don’t necessarily always agree – as, for example, in his debate with Sam Harris on morality. But they are clearly written and refreshing to read. His lecture’s on cosmological questions are fascinating and I am looking forward to reading his recently published book From Eternity to Here: The Quest for the Ultimate Theory of Time . However, Sean does say his hiatus will not be permanent (see Downshifting). And other contributors to the Cosmic Variance blog will continue. Here’s an interesting article by Sean Carroll at Cosmic Variance (The Grid of Disputation). It could be topical here because some have suggested that I may have been a bit harsh in my criticism of theists who have, in my view, been giving an incorrect description of science. Sean provides a grid of the possible disputes one could get into. The implication is that it is pointless arguing with young earth creationists and similar crazies. “Victories” are easy and meaningless. The more fruitful discussions are with the “worthy opponents” – those capable of listening and making reasonable rejoinders. Often we can learn a lot from such discussions – both about our opponents thinking and about subtleties of our own position. There is also the implication that the debate itself should be respectful, not derogatory. However, Sean is clear that mockery does have a place. I agree – sometimes the only way one can handle a silly idea is the mock it or use sarcasm. And, often one should call a spade a spade. PZ Myers, noted for his humorous and often sharp debating style on his blog Pharyngula, comments on Sean’s article in The dilemma of the anti-creationist. He basically agrees , but does wonder if restricting discussion only to those “worthy opponents” could make for a boring life.